Chumak always strives to do something useful for the community and to give consumers an opportunity to make a good deed. This year we are running the "Give a Childhood" campaign. 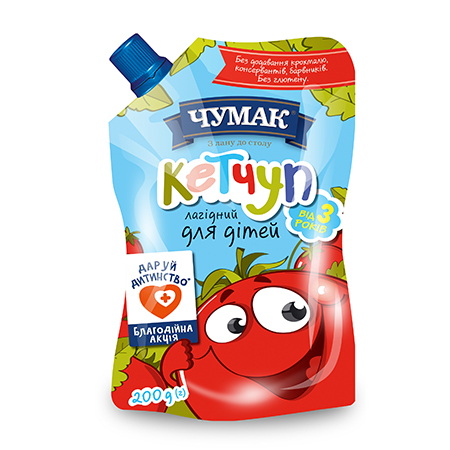 Each month 30 thousand hryvnas from the sales of ketchup Chumak "Delicate for kids" are transferred to the "Tabletochki" Charity Fund, www.tabletochki.org. They are dedicated to help to small patients at the Okhmatdit hospital. Thus, when buying Chumak ketchup, you can help the sick children to get better. The activity lasts throughout 2019.